Brough Wood Pellets has been trading blown bulk wood pellets since 2012 following the installation of our 200 kW wood pellet boiler. Brough Biomass offer delivery of bulk blown wood pellets which are a premium quality wood pellet manufactured to very high standards. Our bagged wood pellets are available in 10Kg. Premium quality wood pellets manufactured and derived from Virgin feedstock sourced from sustainable forests. Call us on 01995 604124 to discuss your requirements or alternatively email us at info@woodpelletsales.co.uk and we will be of further assistance. Brough Wood Pellets based in Garstang, Lancashire, an ENplus registered supplier has been trading bulk blown and bagged wood pellets for fuel since 2012 following the installation of our 200 kW wood pellet boiler. We wanted to source the best quality pellets possible for our own use then we were getting asked if we would supply them to local customers; here at Brough we strive to make our customers happy. We also have bagged 'Woodlets' wood pellets in 10 kg bags always in stock. Brough Biomass is pleased to have gained acceptance to the official UK Biomass Suppliers List (BSL), this list provides details of all fuel suppliers that meet the current sustainability criteria needed for biomass energy. The BSL is a UK Government initiative to ensure that biomass fuels are sensibly and sustainably sourced and make a real contribution to reducing the problem of carbonising the atmosphere. 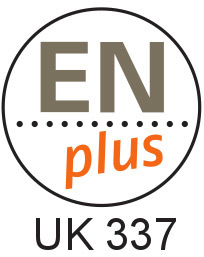 We are also a ENplus registered supplier.